Washington, D.C. – Today, officials from four states – Rhode Island, Virginia, Maryland and Kentucky – testified before the House Energy & Commerce Committee on the rising death toll of the opioid epidemic and the increasing prevalence of synthetic opioids. As the committee examines state and national solutions to address this unprecedented health crisis, Americans for Securing All Packages (ASAP) urges Congress to cut off a major pipeline of deadly synthetic drugs by closing a loophole in the global postal system. Fentanyl and other synthetic opioids flowing into the U.S. can be traced to foreign countries such as China, yet every day over 1 million packages reach the United States through foreign posts without important electronic security data that would allow law enforcement officials to screen and stop deadly material. This data is required for shipments through private carriers, but not for packages sent through the global postal network, providing an accessible route for foreign bad actors to ship drugs across our borders. Americans for Securing All Packages (ASAP), a bipartisan coalition of health care advocates, national security experts, businesses and nonprofits, calls on representatives seeking to address the opioid crisis to support the Synthetics Trafficking & Overdose Prevention (STOP) Act, legislation that would close this loophole by requiring data on all packages shipped from abroad. At the hearing, Kentucky Secretary of the Justice and Public Safety Cabinet John Tilley spoke to Congress on the STOP Act, saying: “I know you’re very well aware of the STOP Act and the issue of keeping fentanyl and carfentanil out of our country,” and noting that the bill would help combat the drug cartels who profit off of flooding the country with these drugs. The STOP Act, introduced in February, has growing bipartisan support, with 18 co-sponsors in the Senate and 193 in the House of Representatives. 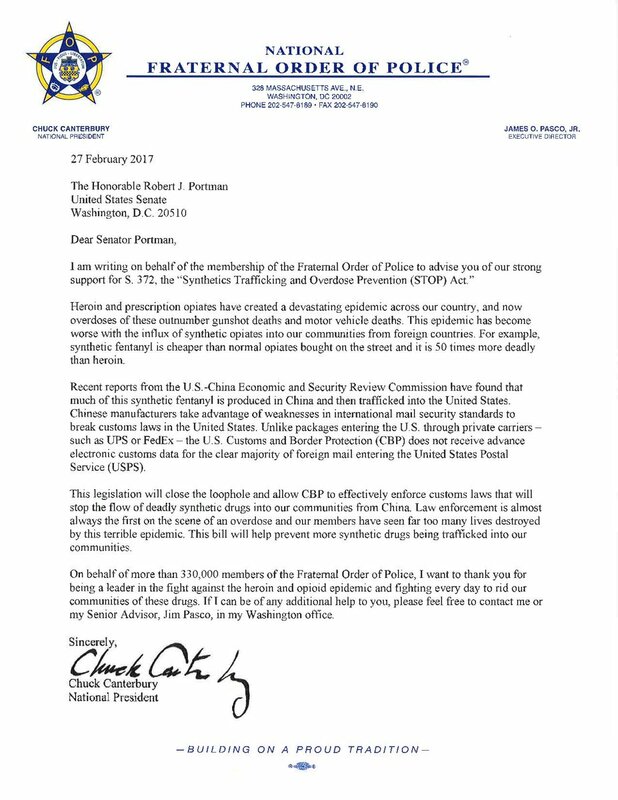 The bill has also been endorsed by the Fraternal Order of Police (FOP) and American Medical Association (AMA), who agree that closing the postal loophole will help those fighting on the front lines of this crisis.